After surviving a near-fatal accident, track coach and mother Dana awakens in hospital, paralysed and imprisoned in her own body. 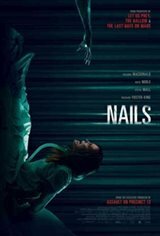 Whilst struggling to regain control of her life, Dana is confronted with a vindictive spirit; a terrifying presence called Nails, whom she is convinced exists inside her hospital room. Faced with scepticism from her husband, doctors and the staff, and believed to be suffering from a mental breakdown, Dana is left struggling to keep her grip on reality as the targeted attacks grow increasingly violent.To save her marriage and her life, Dana must find a way to convince her family that Nails is real before he succeeds in destroying her and everyone who stands in his way.